Choquequirao: The Other Machu Picchu? Not for the weary traveler, the multi-day trek to Choquequirao tests even the most experienced hikers. But what about the result? How about unforgettable Inca ruins far from the crowds of tourists at that “other” site. The streets of the former Inca Capital, Cusco, Peru, are usually filled with tourists from around the world. They come in all forms, from backpackers, dressed in the South American backpacker’s uniform — flip-flops and Che Guevara beards — to the traditional tourist with their expensive cameras dangling from their necks and guidebook in hand. They are all looking to complete a pilgrimage to the Inca Mecca of Machu Picchu. However, when the Peruvian national government announced in February that Machu Picchu would be closed for several months, a good majority of visitors fled town, or canceled their trips all together. The “Inca Trail,” as advertised by the hoards of agencies promoting trekking to Machu Picchu, is, essentially, just a small section of a greater network of Inca Trails that web their way through the lushly covered mountains as far away as Colombia, and down to Northern Chile and Argentina. And Machu Picchu itself, although the crown jewel, is one of only hundreds, perhaps thousands, of ruins left behind by the Inca people. 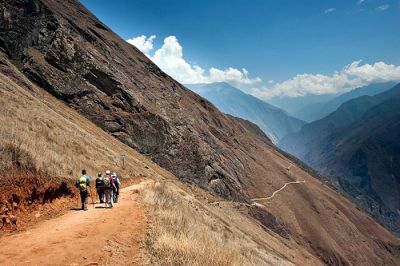 The trail to the site of Choquequirao is one of the less explored treks in Cusco’s Sacred Valley, and when the Inca Trail to Machu Picchu was closed, many travelers took the opportunity to follow this trail less traveled. A round trip trek to Choquequirao can be done in either four or five days, depending on the fitness of the climber. There is also an option for hikers to turn the trek into a six-day hike; it continues from Choquequirao on to Machu Picchu. The trek isn’t without excitement. Just a few years ago, a couple local men spent their time hiding high above hikers and launching rocks down in an attempt to part them from their belongings. Local leaders, however, are said to have taken care of the problem, leaving the trail safe from theft. Nowadays, hikers are more likely to be approached by children from the local villages, dressed in traditional clothing and attempting to sell snacks. 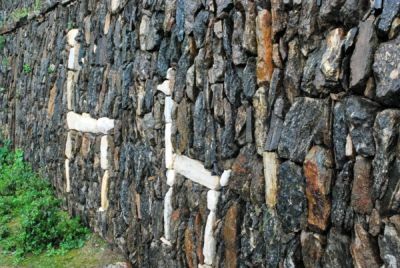 However, the threat of rocks being sent down from above is still a very real threat, especially during the rainy season, when rock and mud slides are a very common occurrence. Hikers are often left scurrying for shelter at the creaking sound of rocks breaking free from their respective landmass. The Choquequirao trail is by no means easy; in fact, most of the local guides claim that it is twice as difficult as the Inca Trail to Machu Picchu. 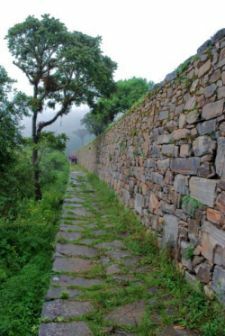 Unlike the Inca Trail, this path is not a highway paved in large, flat rocks. Rather, it is a dirt trail that, in the rainy season (December to March), is often reduced to a thick runway of calf-high mud. Although altitude isn’t too much of an issue along the trail, hikers are challenged by constant inclines and declines. Day two of the hike pushes climbers nearly 1,500m straight up, more than three times the height of the Empire State Building. This section can easily reduce the manliest lumberjack to tears. The painful state that the relentless climb has reduced hikers to, however, is rewarded by entry into the site of Choquequirao. Much like Machu Picchu, Choquequirao is far from being the oldest Inca site. It is estimated that the site was constructed only about 400 to 500 years ago. Like the more famous site, the jungle has overtaken much of the site over the past couple of centuries. However, unlike Machu Picchu, this site has yet to be fully recovered and restored. It is estimated that only about 20-40 percent of the site has been uncovered. What has been uncovered are thick walls of Inca stone, as well as managed, terraced land. It takes a nostalgic eye and imagination to try and understand what Choquequirao must have looked like during its days as a checkpoint for entrance into the Vilcabamba Valley. The wide, triangular walls must have, at one point, been covered by strategically laid thatched roofs, providing occupants refuge from the pounding tropical rains, and the smartly constructed terraces must have been covered at the time with crops of corn and a variety of fruits. Perhaps the most impressive feature found within this Inca archaeological site is a set of terraces that have been enlaced with figures of llamas or alpacas. Regardless of the painfully hard work required to erect these large scale terraces, someone took the time to insert shapes of this animal using white rocks, a show of the large importance it held to these people at the time. Although few places on earth can really compare to the mystique revealed to hikers as they cross under the sun gate and into the site of Machu Picchu, Choquequirao provides an intriguing destination that few people give themselves the opportunity to see. The difficult hike is as rewarding as any in the region, and in the future many more people may choose this as an alternative route in reaching Machu Picchu. The most intriguing aspect of Choquequirao is its absolute rawness. Perhaps because a lack of interest, or maybe because of an influx of government funds into the more famous sites, Choquequirao remains largely uncovered. Unlike Machu Picchu, which by 9:00 a.m. is packed shoulder-to-shoulder with visitors, Choquequirao is nearly empty and free for visitors to enjoy in peace. The lack of train transport and the simple fact that it’s a difficult hike, should keep it this way for the near future. So as hikers retrace their steps down the knee-shattering, 1,500m descent, they can be satisfied in the knowledge that they have experienced something few others have. For the world’s true travelers, when one door shuts, or trail in this case, another one opens. Nearly all the trekking agencies in Cusco offer some sort of guided hike to Choquequirao. However, to be sure, you should book at least a couple of weeks in advance. One of the most reputable trekking agencies in Cusco is SAS travel (http://www.sastravelperu.com/). They have well-treated porters and great guides who will look after your every need. They include all your meals, which are top-notch, and provide snacks and water each day of the hike. Machu Picchu Has Re-opened, What Now? April marked the start of the dry season, as well the newly re-opened Inca Trail (and Machu Picchu itself). Jose at SAS Travel says that “the best time to visit (the area) is May and June.” According to this well-journeyed hiking guide, the area is still nice and green from the rainy season, dry enough that you will be able to enjoy the hike, and it is still be calm before the summer’s rush of tourists. Of course the re-opening of the popular Inca Trail will mean that the number of treks to Choquequirao will likely drop significantly. However, this is still a great alternative to the Inca Trail. While a booking for the Inca Trail to Machu Picchu requires a booking at least three or four months in advance (and in some cases as many as eight months), during the spring/summer months a trek to Machu Picchu via Choquequirao can be booked only weeks in advance. The other great reason for hiking this trek is the lack of people on the trail. Unlike the Inca Trail you will never have to jostle for position with other hikers. You can find Brendan’s blog at The World Is My Jungle Gym.